The Grumman Avenger ranks as on of the greats of naval aviation. With the Navy fully aware that the Douglas TBD Devastator had been passed by as far as the development of carrier-based attack aircraft was concerned, Grumman began design of what became the Avenger in early 1941, with the prototype making its first flight on December 8, 1941. The emotive name “Avenger” was given with full regard to the event that had happened the day before that first flight. 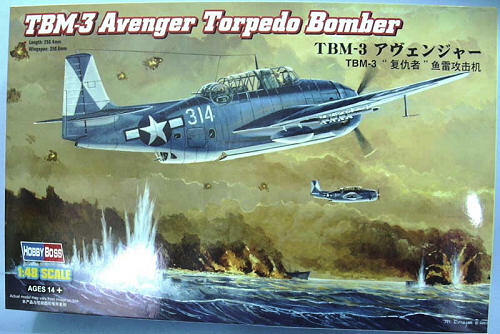 The TBM-3 was developed in early 1944, to provide more power with an uprated engine which would allow the Avenger to operate without restriction from smaller aircraft carriers. Production of the TBM-3 was entirely the responsibility of Eastern Aircraft, the company created by General Motors to put their New Jersey automobile plants to work building airplanes during the war. The TBM-3 began appearing in squadron strength by the time of the first Tokyo raids in February 1945, and had entirely replaced the TBM-1C in first line service by the summer of 1945. The airplane soldiered on in the U.S. Navy and the air forces of many other nations until the mid-1960s, and was also adapted as a firebomber in the mid-1950s. The Hobby Boss Avenger follows the Accurate Miniatures Avenger series by 14 years. Given that the A-M kit has been called the best plastic kit ever, there were some who wondered what the Hobby Boss version would be like and whether it would even be worth obtaining, given the quality of the A-M kit. 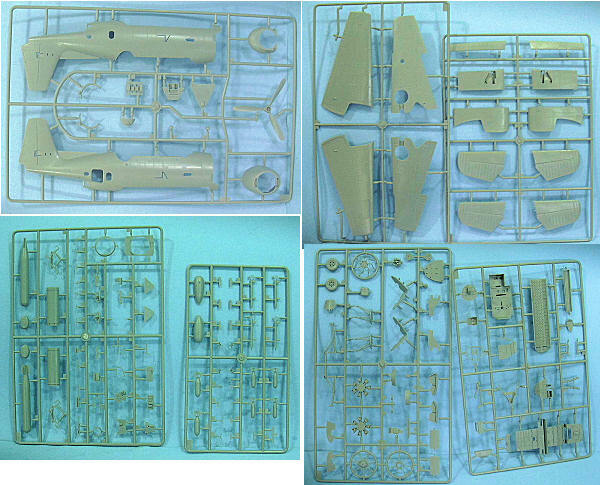 On opening the box, anyone who is familiar with the Trumpeter 1/32 kit will see that what’s there is far more the Trumpeter kit shrunk down than it is any sort of copy of the Accurate Miniatures version. The kit provides an accurate cockpit with good detail that includes an option to display the canopy o pen to the second cockpit, as well as detail in the wings that the A-M kit never had: positionable flaps with interior detail and a wide assortment of armament including two different versions of underwing rockets. Most important for many, it includes a wing-fold option. The good news here is that this wing-fold option is almost as simple as that used by the old Dangerboy resin set; Hobby Boss obviously took the time to study that kit and adapt its operating principles for an injection-molded plastic kit. This is very good because the wing-fold option created for the 1/32 Trumpeter kit is nearly impossible to use successfully. 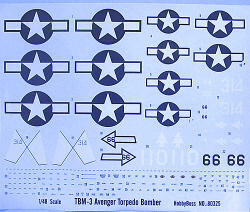 Decals are provided for three airplanes. Unfortunately, the VT(N)-90 airplane cannot be done since the one thing Hobby Boss did not include in all the options was the radome for the TBM-3D. Many modelers over the years have expressed a desire to have an Avenger with folded wings. The KMC conversion was close to impossible without some serious creativity on the part of the modeler (though yours truly did figure out a pretty nifty way of using wire inside the outer wing to hang it from, thus removing the problem of the lack of structural integrity in the conversion). The Dangerboy set came and went quickly, though it has been available from Mike West at Lone Star Models for the past several years. This kit provides that capability and more, without having to resort to an expensive aftermarket set, and without being so challenging that a modeler of average ability can’t build this kit and have a nice model as a result. Highly recommended for those who enjoy naval aviation subject matter.